The Proscenium Arch was the most common form of theatre building in the 18th, 19th and 20th centuries. The “Arch” acts like a picture frame through which the action can be seen. The picture above shows the Proscenium Arch of the York Theatre Royal in the UK. The term “Proscenium Arch” (or “Pros” to use a common theatre abbreviation) is also now used to describe any staging configuration in which the audience faces the stage straight-on regardless of whether or not there is a physical “arch”. Most theatres built from the 1950s onwards have an “open arch” which is essentially an undecorated aperture in a wall. This diagram shows the basic configuration for a Proscenium Arch Theatre. The Audience faces the stage. 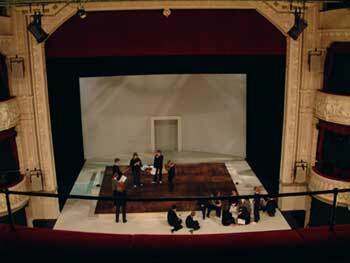 “Wings” sit by the left and right sides of the stages, used to store scenery, effects and act as waiting areas for actors. An Apron is a segment of the stage which protrudes through and beyond the Proscenium Arch. Traditionally the apron was used by actors to “break throughÃ¢â‚¬ the proscenium and directly address the audience (in an “aside” for example). The apron was also used by comic performers or Master of Ceremonies in Music Hall or Vaudeville productions. Some debate exists as to how far back in European theatre history the concept of “breaking through”the Proscenium goes. For example we know from the text that Shakespearian characters addressed the audience but it’s believed that all of Shakespeare’s characters were aware of their audience. This contrasts to the renaissance theatre style in which only characters who entered the apron or directly confided in the audience were aware of the auditorium and its audience.